ELLENTON, Fla., (Sept. 18, 2018) - The 17-round schedule for the 2019 season of Monster Energy AMA Supercross, an FIM World Championship, will deepen its live event footprint with new and returning markets and the debut of Supercross Futures, an AMA Amateur National Championship. Highlights of the reinvigorated 2019 schedule include the notable addition of Nashville''s Nissan Stadium for the first time in the sport''s 45-year history before swinging through Denver''s Broncos Stadium at Mile High for the first time since 1996. 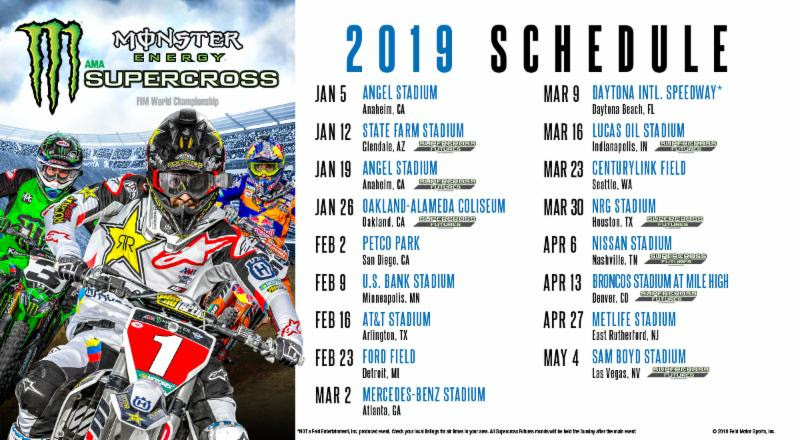 The series will commence at Angel Stadium in Anaheim, Calif., which has hosted the most rounds in the history of Supercross, and continues virtually nonstop, returning to Ford Field in Detroit, Mich. and MetLife Stadium in East Rutherford, N.J., which were both last on the schedule in 2017. Click on the image above to view the 2019 Monster Energy Supercross schedule video. "We''re continuing to improve the fan experience and live entertainment aspect of the sport by using state-of-the-art technology, from spidercam footage and live heart rate monitor displays, to featuring a festival-like atmosphere in the paddock," said Dave Prater, Senior Director of Operations for Two-Wheel, Feld Entertainment. "As we head into 2019 with a brand-new defending champion for the first time in four years, Jason Anderson will certainly be the one to watch. That, combined with the sport''s first-ever developmental platform for Supercross amateur racing, will ultimately set the stage for years to come." Jason Anderson secured his first-career 450SX Class Championship at the final round of the 2018 season on May 5, which also marked the first 450SX Class Championship for Rockstar Energy Husqvarna Factory Racing. Photo credit: Feld Entertainment, Inc.
All tickets for the 2019 season will go on sale on Tuesday, October 23 with a presale date of Tuesday, October 9. "The 2018 season proved once again that Supercross is a very exciting sport. 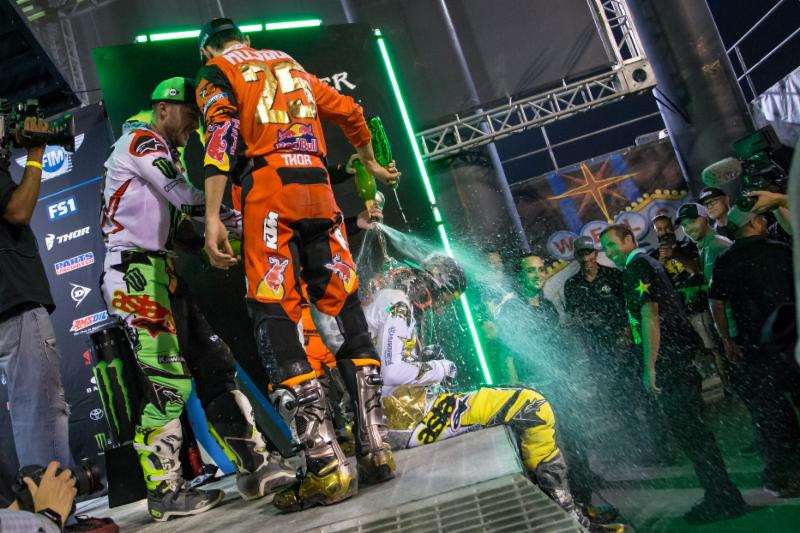 It kept us on the edge of our seats until the final round in Las Vegas," stated FIM President, Vito Ippolito. "Supercross is also a demanding discipline and one that brings the best out of the riders and their teams. But most of all, it is an unpredictable sport that can take us all by surprise! Much kudos goes to the 2018 AMA Supercross FIM World Champion Jason Anderson, who is a worthy successor to Ryan Dungey. We are looking forward to a successful 2019 season with a curtain raiser in Anaheim next January and a final act in Las Vegas in May." To continue shaking up the competition while maximizing the importance of earning every point toward the overall championship, the 2019 schedule will once again feature three fan-favorite Triple Crown events and two East-West Showdowns, which will be revealed on October 23 when tickets go on sale. Monster Energy Kawasaki''s Eli Tomac will look to defend his inaugural premier class championship within a championship as the Triple Crown pits riders in each class against each other in three Main Events, adding to the super competitiveness of the series. Supercross Futures, an AMA National Championship, will build upon the success of 2018''s four Supercross amateur racing events with Glendale being the first of eight beginning on January 13, 2019. The innovative concept will provide even greater access to the sport''s largest stage and help to foster a professional learning environment for budding amateur athletes earlier in their careers, while enabling top amateurs to earn Road to Supercross points toward their professional AMA Supercross license. Supercross Futures events will take place on Sunday directly following Saturday''s professional events with the championship being held October 20-21, 2019 after the Monster Energy Cup on October 19 in Las Vegas. "AMA Supercross is among the most impressive displays of two-wheeled motorsports in the world, and for many amateur AMA racers, it represents the pinnacle of their competitive dreams," said AMA President and CEO, Rob Dingman. "Since the first AMA Supercross Champion was crowned in 1974, the sport and spectacle have grown and evolved, thanks in large part to the close cooperation with our promoting partner, Feld Motor Sports. Generations of some of the world''s greatest motorcycle racers have held high the AMA Supercross No. 1 plate, and I can''t wait to see who earns that honor in 2019." Before the 2019 season officially begins, the sport''s top athletes will battle it out in Las Vegas on October 13 at the invite-only all-star event - the Monster Energy Cup. Following a second-place 450SX Class finish in 2018, Red Bull KTM Factory Racing''s Marvin Musquin will return to Sam Boyd Stadium and attempt to defend his 2017 Monster Energy Cup title. If successful, Musquin will become the first athlete to ever win the "Monster Million" twice. Catch all the action live on FS2 or via the FOX Sports GO app at 6:30 p.m. PT, or visit SupercrossLIVE.com to purchase tickets. For the third consecutive year, Supercross Video Pass will provide live and Video On Demand (VOD) access to fans outside of the U.S. The 2019 Supercross Video Pass will include 240+ hours of heart pumping, on-demand video archives from the previous four seasons. Fans who purchase the 2019 Supercross Video Pass before October 13 will receive access to the 2018 Monster Energy Cup. Visit supercrosslive.tv and sign up to be notified once the purchase period begins. Monster Energy AMA Supercross, an FIM World Championship, is the most competitive and highest-profile off-road motorcycle racing championship in the world featuring innovative track designs and attracting impressive crowds set inside recognizable and prestigious stadiums. Feld Entertainment, Inc., parent company to Monster Jam®, Monster Energy Supercross, Disney On Ice, Disney Live!, Marvel Universe LIVE!, Sesame Street Live!, and DreamWorks Trolls The Experience (coming Fall 2018) is the world''s largest producer of live family entertainment. Visit SupercrossLIVE.com for more information.